What happens when all means of transportation and communication suddenly vanish? What happens when you can’t call for help? What happens when the only person you can rely on is yourself? 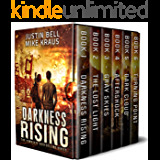 What happens when an EMP sends Washington DC back into the stone age? 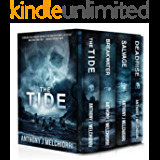 Find out now with this collection of unputdownable EMP thrillers. An EMP explodes over Washington DC and the world comes to screeching halt. 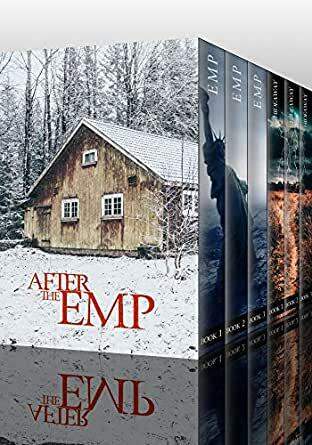 As society falls into dismay, Harper Murphy, a skilled army quartermaster/single mother, charges headlong into the escalating chaos to save the only thing she holds dear: her son. In a world rife with chaos, how far would a mother go to protect her family? James and Marla Weller are preparing for a relaxing weekend, when an unexpected blackout spreads far beyond their St. Louis suburb and starts a devastating chain reaction. But the disabled power grid was only the beginning of a national nightmare as their vehicles and cell phones won’t function either. A series of building explosions rock downtown, leading to a mandatory evacuation. Amid the chaos, the young couple must make a decision on where to go. A possible solution emerges when a self-proclaimed survivalist offers them refuge in his remote cabin far from the city and away from the chaos. 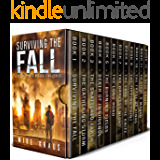 But James and Marla soon discover that survival isn’t as clear as they think, and that escape can lead to dangers all its own. 2.0 out of 5 starsConfusing. What frustrated me as a reader was that the last book in this set doesn’t seem to be related character wise to the other books. I had so much trouble finishing this boxset. The author has done well in terms of the idea yet I’m not sure I’ll read more of their work. I’m sorry it was just difficult. I was taken aback when this blockbuster came available in November. It consists of two complete apocalyptic fiction titles. The first is a reprint of the three books comprising "EMP No Power" and the second is "Hideaway." I have read both books previously and published reviews of them, so I'm keeping this review shorter than normal, in an attempt to highlight what might be important for prospective readers. BLUSH FACTOR: There are a very few eff-words, less than one per hundred pages. For me, this was not an issue, since I believe the word is used to establish the authenticity of the characters and the times they reflect, with good effect. STAND ALONE OR CLIFFHANGERS? Buying this version, this is a stand-alone with no annoying cliffhangers. '...The trucks before her twisted and swerved to dodge the bullets, but dead bodies hindered their speed and maneuverability. Some of their drivers were even forced to stop and shoot. Bullets broke glass, metal, and the enemy’s skin. Compared to the M60’s massive rounds, the insurgents’ puny vests didn’t stand a chance. Harper’s world became one of noise and bullets and death. It was only her and her targets. Any second could be her last, she knew, as countless bullets burrowed into the side of her Humvee and turret guard, but she did not relent. She would not let death have her. Her family, her soldiers, her country needed her. Like a strobe light, muzzle flashes lit up her hardened face with every shot. She felt alone in her battle, but her barrage of bullets was joined by others, and she knew that her allies were still with her. Trucks veered into the side of the bridge, leaving long stripes of black paint on the bridge’s fence. Others reversed and jammed their wheels on the heaps of dead bodies. The cry of their engines and the sinister squish of the rubber against flesh sounded as they tried to remove themselves from the meaty piles. Every moment she watched, more bile clawed at Harper’s throat. Her turret put a quick end to the drivers. Harper dropped four more trucks before her gun jammed. She slinked down into the gunner station as a volley of bullets pierced the Humvee’s back windshield and cut against her cheek. The Hummer thumped like a bass drum with every hit it took. Blood running down her jaw, Harper reached around to the front seat and fished out the pistol. She took a deep breath and burst out the door. A stream of bullets chased her to a supply box, where she took cover. It was plastic. Without hesitation, Harper quickly dropped prone as bullets tore through the weak material and sent shards into the sky. Once it died down, she crawled on her forearms and knees over the dead soldiers and civilians around her. Stationed behind Humvees and crates, the army and National Guard fired back at the encroaching insurgents that had yet to pass the barrier in one piece. Harper didn’t see her husband over the mass of warm bloody bodies, but she kept on crawling. “You will,” Harper reassured him, making the mistake of rubbing drips of perspiration from his brow with her blood soaked forearm. Donovan, J.S. 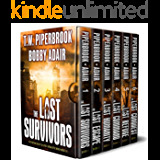 After the EMP: Survival in a Powerless World (Kindle Locations 1067-1089). Kindle Edition. I am striving to produce reviews that help you find books that you want, or avoid books that you wish to avoid. With your help, my improvement will help you and me improve book reviews on Amazon. Together, you and I can build a great customer review process that helps everybody. Will you join me? It is people such as you who have helped me improve over the years. I'm still learning, and I have a great deal yet to learn. With your help, I'll improve every day. One request: Be respectful and courteous in your comments and emails to me. I will do likewise with you. Thank you so much for indicating if this review helped you, or for your comment. for indicating if this review helped you, or for your comment. 93 people found this helpful. This is the same story set that I bought and read some time ago, but with a different name! The story and writing are enjoyable enough, so if you like this kind of story, it is good, but I don't want to buy the same books twice. I even checked my listing of books I already owned before purchase and this was not in it. Yet, when I began to read it, I discovered that the content was identical to a past purchase by the same author. If you're going to change the name, at least include something like "formerly published as..." and list the old title, so that nobody is misled. 41 people found this helpful. If you are looking for gore, this is your book. Otherwise don’t bother. 3.0 out of 5 starsWhere is the proofreader?! The plot is good, the action great. A few surprises thrown in, keeping you reading way past bedtime. Unfortunately, there are SO many spelling errors, missing words, or incorrect words used, it became annoying, distracting, and downright frustrating. i’m guessing this is the publisher’s fault, not the author’s, though I would have rated it much higher if not for that. I just finished the third book of the six that make up this box set. For starters, it was hard to stop reading. The action sequences were nail biting, and created a desire to skim read to hurry up and find out what happens. It's entertaining, full of suspense, and worth reading. The issues are things like an early description of a flag blown by an autumn breeze, but everything else referring to spring. The interaction of military personnel with each other was full of BS, on par with bad B movie. There seemed to be almost ZERO understanding of firearms - also on par with a really bad B movie. And many of the action scenes and plot lines were VERY cliche and predictable. The upside is they were pieced together in a can't-put-it-down series of well written events. It won't be a chart topping best seller, but if you ignore the minor flaws, it's a fun journey. Edit: I've finished the second half of the box set. The second half is a much better story. Very intense, and a great read... Except... If the author has an editor, he needs to fire him, if not he needs to get one! I can't tell if the second half is the same event, told from a different perspective and characters, or if it's an independent story starting with a very similar EMP event. The timeline is fall instead of spring, like the first half, and there are still A LOT of errors regarding guns - a. 38 special doesn't have a clip to drop to see how many rounds are left, etc. And the typos, missing words, and similar mistakes as so frequent in some places as to become distracting. One chapter in particular was downright annoying. And early on, it's September, but 24 hours later, in the story, it's October 21st. But... If you can look past that, this is one hell of a story that's hard to put down. With decent editing, this could actually become a superb book, that could top the charts in its genre! I recommend that you give it a chance and look past the errors. As long as you are prepared for them, you won't be disappointed.